Considering the wild, freaky presentations I've been posting recently, I thought I'd lead off today with something quiet and simple. I had stepped out earlier this evening to check out a movie shoot going on near my place, and snapped the shot above on the spur of the moment. It was well after sunset, so the sky was a deep, rich blue, and the main gate of the Heian Shrine a deep, rich orange, and the reflections in the water a mix of rich colors (blue from the sky, green from the street lights). All and all it was “rich”, but seeing as I've posted that kind of shot before (both from around this same location and from the nearby canal), I thought I'd give this one a try as black & white. 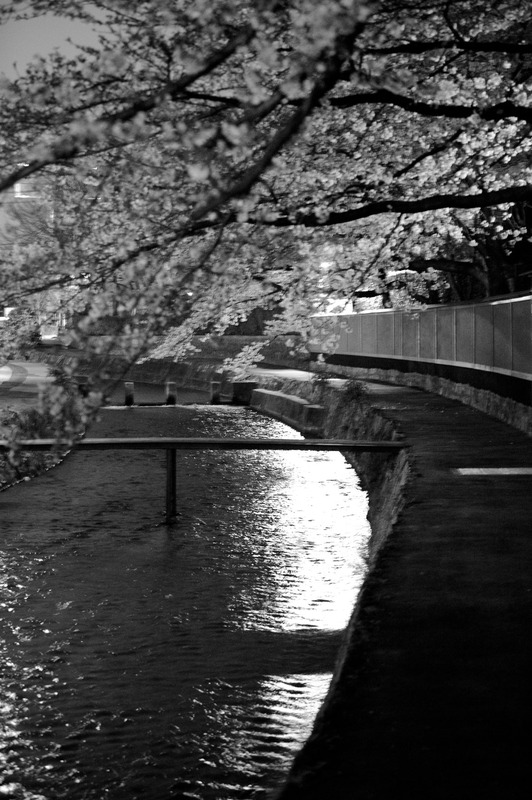 It's not too bad for a half-second exposure at 70mm, hand-held, freestanding. 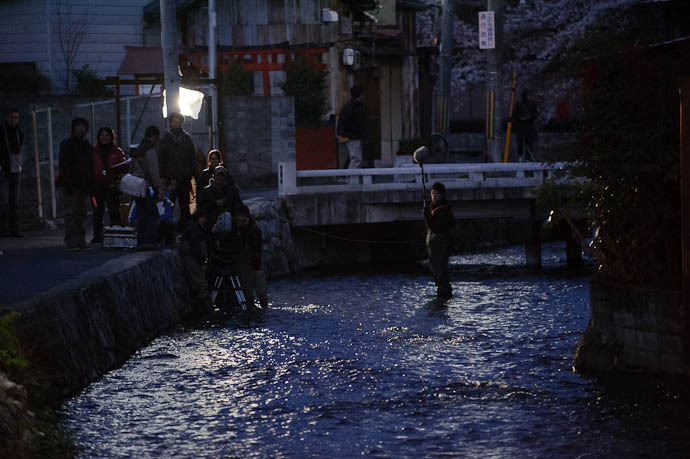 They were shooting scenes from a movie to be called 『マザーウォーター』 (“Mother Water”, whatever that means). It's the same group that did the slightly eccentric comedy 『かもめ食堂』 (“Kamome Diner”), which we liked. I didn't want to be in the way, so went off some distance to grab a shot of the scene (the shot you see above, with a guy in the middle of the river holding a big microphone, and the camera at the edge of the water on the left). 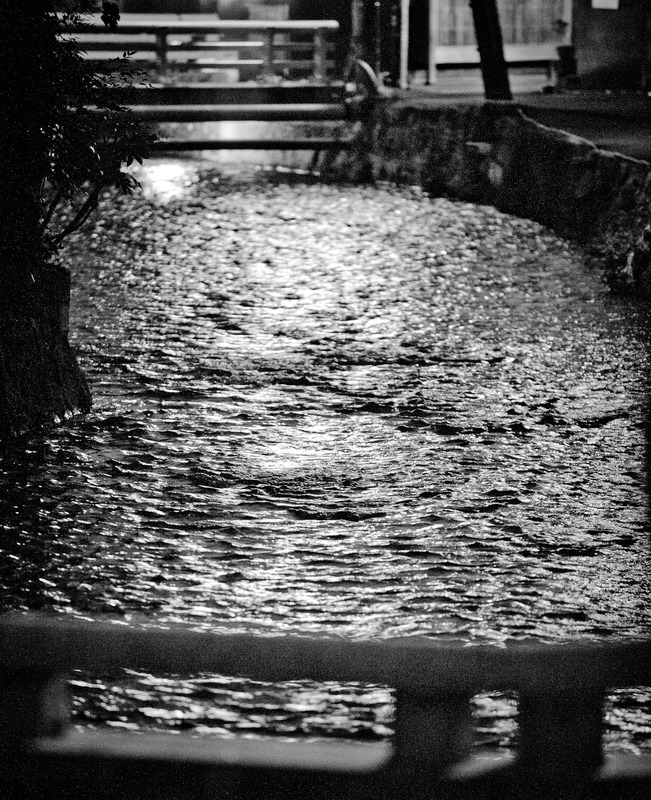 It was dark so I couldn't really see what was going on, but in looking at the shot now, I see that the camera is pointed right at me, along with the gaze of everyone, with smiles on their faces. This explains why moments after taking the shot, someone came up to me and asked very politely whether I might stand a bit off to the side for a minute or two while they filmed a shot... doh! During that time the same guy stopped a few random passers by, also requesting very politely that they pause for just a minute. (Judging by when they did/didn't do this, they seemed to have filmed for only about two minutes during the half hour I was there... a lot of effort by 40 people for so little!). They were actually shooting on real film, not digital, but they did have some kind of digital recording going as well, so they could check out framing and such in real time. 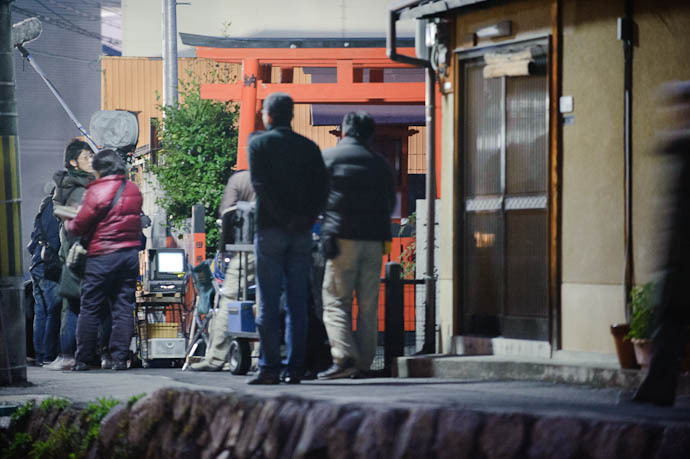 In the shot above, they're sitting in front of a local shrine that was decommissioned a few years ago, checking out framing on a monitor for their next shot. You saw “Kamome Shokudo” too? We really liked that one. Low key, no fuss, but just…nice. Do you mean that they were going to put the decommissioned shrine in the shot?